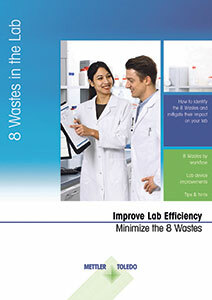 Previously ‘The Typical 8 wastes in the laboratory’ guide introduced an explanation of these 8 wastes, with typical laboratory examples, and recommendations for how to reduce or eliminate waste in these situations. The latest identification checklist takes it one step further by providing a template to measure the efficiency of a specific laboratory based on the occurrence of waste in the workflows. This checklist is organised into 8 sections, based on the 8 wastes from Lean principles. It consists of a series of criteria with recommended target values that should be met. Based on the entries recorded during the audit a total score is calculated with a maximum of 33. Any scored below 20 shows significant potential for improvement. This entry was posted in News and tagged Editor Recommends, laboratory. Bookmark the permalink.